Groove tubes were founded back in 1979 by Aspen Pittman and have become one of the most respected valve brands in the world. The first is standard which is tested and selected by Groove tubes using their in house selection and grading. The second is Groove tubes Super Premium Burst tested which in addition to GT In house testing we additionally Drive test all pre amp valves and burst test all out put valves. So when you combine this with Watford Valves special test facilities you get a GT distortion rated output valves which has also undergone our own unique real world burst testing and then dual matched by us on current and gain. All pre amp valves in addition to GT in house testing are then drive tested by us and checked for noise and microphoney. We believe this combination gives you the best tested valves available anywhere in the world. Groove Tubes Super Premium valves are specially burst tested by us. We take selected GT items and in addition to GTs in house testing and distortion rating on output valves they also undergo our own unique real world burst testing. The burst testing process involves a series of varying timed electrical signal bursts. This runs the valves under the same stress conditions that they will meet in your amplifier. All out put valves are then dual matched by us on current and gain. This will ensure that you get the best selected GT valves available anywhere in the world. 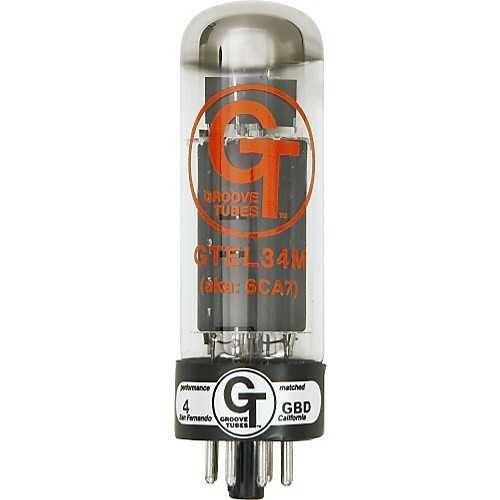 The GT EL34 M Groove tube is based upon The Mullard EL34 XF2 batch code item. This is a great blues valve as it is very touch responsive in Marshall Amplifiers, think of Gary Moore tone on “still got the blues” and that is what the GT EL34 excels at. We stock the medium performance rating as this offer the best all-around sound for all styles of playing. These items are only supplied in matched pairs or quads. Please note that we do not sell this product in singles.